The below artworks are the most important by Fairfield Porter - that both overview the major creative periods, and highlight the greatest achievements by the artist. Artwork description & Analysis: Due to the financial hardships of World War II, Porter and his family rarely traveled outside New York City between 1941 and 1946, forgoing visits to their home on Maine's Great Spruce Head Island. 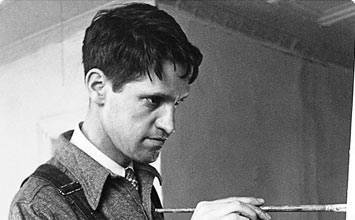 During these years Porter was obliged to adjust his work patterns to city life. This untitled work from 1945 depicts Manhattan's First Avenue, presumably the corner just a half-block from the family home on East 52nd Street. The drab grays and browns of this painting, which are quite different from his vibrant use of color in later works, indicate Porter's somber mood, brought about by family strife and ongoing confinement to the city. Artwork description & Analysis: This scene of Porter's daughter Katherine and wife Anne is characteristic of the artist's oeuvre. 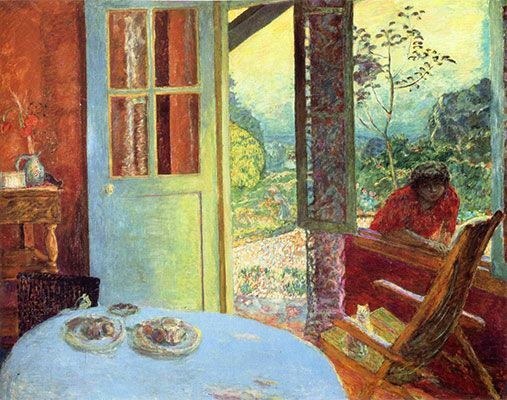 Its interior setting, its golden light, and its intimate glimpse of family members in a moment of tranquility all show the influence of Édouard Vuillard and Pierre Bonnard on Porter's work. Yet the setting of the Porters' home is distinctly American and mid-20th century, from the rug on the floor to Anne's clothing. Even while painting a spacious room and the landscape beyond its window, Porter insists on the shallowness of his pictorial space and the flatness of the colors he has placed upon the canvas: certain passages of brushwork, particularly in the curtains and the chair in the background, are nearly abstract. As scholar William Agee has written of this work, "The surface is a single entity, all of it simultaneously present. Porter sought, as did Matisse, to make every corner of the canvas alive." Oil on canvas - The Hirshhorn Museum and Sculpture Garden, Smithsonian Institution, Washington, D.C. Artwork description & Analysis: Porter painted several self-portraits of himself in the studio, and here he combines a self-portrait with a portrait of his ten-year-old daughter Elizabeth in the family's Southampton house. The Mirror's composition is complex: Elizabeth faces the viewer (and, by implication, the artist), and the mirror acts as a picture-within-a-picture, reflecting Porter as well as the room and the landscape beyond the window. In this single work, Porter pays homage to several of his artistic heroes. 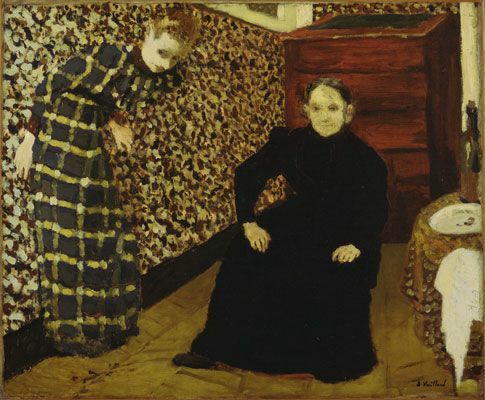 One is Édouard Vuillard, of course, but he also refers to Henri Matisse, whose Carmelina (1903) used a similar device of a frontally posed girl and a mirror reflecting the artist, and Diego Velazquez, whose Las Meninas (1656) is the forerunner of all such self-portraits within studio portraits of young women. Leonardo da Vinci is even present, in a detail of the Mona Lisa (1503-17) pinned to the studio wall. Despite these art-historical allusions, however, the specificity of Porter's studio (with its wood-burning stove) and the architecture beyond the window grounds the picture in the reality of the 1960s and coastal Long Island. Porter is both inside and outside the picture, unifying its reality and its reflections, history and the present day, in a skillfully arranged configuration of images within images, while putting us in his place to consider what it means to perceive and represent the world around us. Artwork description & Analysis: Porter routinely experimented more with color when painting outside, yet his subjects always remained identifiable. 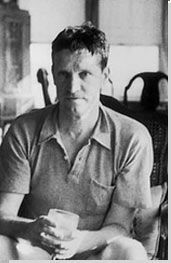 As he wrote in 1960 for The Nation, "Reality is stronger than thought, feeling, the means of its achievement, the artist's ego or his subjectivity. "The visual complexity of this landscape painting underscores the richness of Porter's family history. This scene includes the house that Porter's architect father had built on Maine's Great Spruce Head Island decades earlier; as Porter once said in an interview, every painting of this house was, in a way, also a portrait of his father. In this idyllic view, a boat sails on nearby Penobscot Bay and the family dog rests in the shady foreground. The intense yellows, greens, and blues suggest a Fauvist influence, but the cropping of the scene and the use of flattened forms in shallow pictorial space show Porter's interest in abstraction. Every element of this visual arrangement, even ephemeral things like the reflections in the windows to the shadow on the grass, has a weight and presence of its own, yet all the disparate parts fit together on the picture's surface like a perfectly designed jigsaw puzzle. Artwork description & Analysis: The ostensible subject of this well-known painting is his daughter Katie, posed in the yard of the family's Long Island home, yet Porter was less interested in capturing his sitter's personality than in visually integrating figure and background. The designs of the girl's vest are echoed in the broad patches of sunlight and shadow on the lawn and in the formations of the tree's foliage. This painting encompasses Porter's painterly style and philosophy: as a realist, he depicted locations and individuals from his own life, but he rendered those subjects with an expressive quality that recalled the turn-of-the-century Parisian masters. Under the Elms demonstrates why some of the great Abstract Expressionist artists admired Porter's art: in works like this one, he skillfully incorporated surface patterning and all-over compositional effects into representational imagery, while still suggesting a reality above and beyond the observed world. The landscape could almost be a fantastic scene within the girl's own imagination, as she stands on the threshold of adolescence. Artwork description & Analysis: Broadway South of Union Square, a Manhattan street scene, dates to the final year of Porter's life. This cityscape places the viewer at the corner of Broadway and 12th Street, facing north towards the greenery and open public areas of Union Square. American Impressionists had been painting the area around Union Square since the late-19th century; Porter anchors his scene in his own time, however, with the inclusion of 20th-century traffic lights and automobiles. His abstract handling of paint is evident in the office buildings' grid-like banks of windows, the simplification of the distant trees, and the cursory treatment of the pedestrian's faces and clothing. Even the iconic Empire State Building, visible from its location twenty blocks north, is reduced to flattened planes and dark, angled edges. At the same time, this imagery of an urban street, from its vehicles to its signage, reminds us that Porter's career overlapped with such movements as Pop art and Photorealism, which brought representational imagery back into artistic vogue. First published on 25 Jan 2009. Updated and modified regularly.